Demeter has released some fresh, light scents for the summer! This collection is excellent for those that like to wear clean, natural scents. Each is designed to be worn alone, or combined in various proportions to create your own customized, personalized and idealized summer fragrance. BABY POWDER – As clean and as fresh as it gets, just like the proverbial freshly powdered baby’s behind. Demeter’s Baby Powder takes you on a scent journey through the purity and innocence of childhood. PURE SOAP – Feel “fresh from the shower” clean… anytime… anywhere. There is nothing like the clean smell of freshly showered skin, especially when a pure, unscented soap is used. Demeter’s Pure Soap is a subtle yet powerful scent, the kind of fragrance that is Pure Demeter. CLEAN SKIN – What’s sexier than clean, post bubble-bath skin? A blend of orange, lemon, white rose, bergamot peach and vanilla, make for the perfect shower-fresh scent. 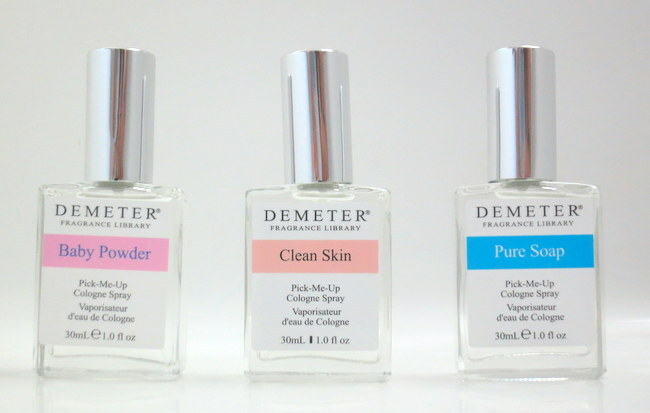 Clean Skin by Demeter is a virtually transparent and delicate fragrance. Smells like the best version of you – just better.